No Congolese army in town while the inhabitants of Goma and with them about 20.000 UN soldiers simply watched the fighters of the M23 rebel movement enter the city and take it under their control. With that, one of the Great Lakes Region’s strategically most important cities has been captured. Almost no fighting has been reported and it was rather a silent invasion than heavy exchange of fire. Meanwhile thousands fled North Kivu’s provincial capital in fear of an uncertain security situation. Although fighting failed to appear during the last days, people are afraid of plundering and killings. But the seizure of power in Goma brings another even more dangerous factor with it. DRC government officials blame the Rwandan administration in Kigali of backing the rebel movement in order to gain control of the neighboring North Kivu region. Here parts of the population still consist of former génocidaire who fled the RPF invasion in 1994. It is estimated that the whole military corps of the ex-FAR (Forces Armées Rwandaises) and FDLR fighters (Forces Démocratiques de Libération du Rwanda) are still hiding in the dense bushes of the region. This illustrates how explosive the invasion of the M23 in Goma actually is. It remains to be seen how the communication between the government in Kinshasa and the group of Sultani Makenga, leader of the M23, will develop. If the rebels stick to their plan of fighting the DR Congo government until it falls, it is possible that the region will be going through another long period of warfare. 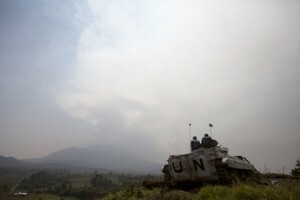 Goma residents were promised to be delivered peace by the M23 but most feel anything but safe.